Even as I hold fond memories of watching the film adaptations with my mother and sister, I’ll have to admit that I never got into the original Sisterhood series. It’s not that I disliked the books: I just definitely missed the pre-teen demographic when the novels became popular. The premise is this: ten years have passed since readers met with the main characters (Tibby, Lena, Carmen, and Bridget, for those of you in the know), and in that time, the close-as-sisters friendships have faded away. The impermanent, changing nature of seemingly-forever high school friendships struck me as very realistic; I was relieved that these women in their late twenties weren’t still living out the same idealistic, fantasy-based friendships that they were as high school and college students. After brief catch-ups on the characters’ lives, loves, and careers, Brashares takes Lena, Carmen, and Bridget out of the US and over to Greece on the invitation of Tibby, who desires and then orchestrates a reunion and mending of fences. Greece, of course, is significant from earlier novels to the girls (and the breathtaking setting also offers a potential reuniting of Lena and her long-lost love, Kostos). Even though the girls have drifted apart, they all jump at the chance to come together and reignite old bonds. However, nothing goes as planned, and believe me when I say that you will very likely be shocked at what awaits the four girls in Greece. Those details are the best I can offer without giving away more of the twisting, absorbing plot (and the plot really must be kept under-wraps for the best reading experience). Truly, though, I experienced genuine surprise at the grittiness with which Brashares wrote this novel. It’s not a fluffy, empty read by any means: who knew a Sisterhood book would offer that kind of substance? I’ve got to admit my pleasant surprise. In fact, Brashares shows real bravery in how she writes her characters. She does not shy away from examining their flaws and putting them through some really difficult ordeals. I greatly admire her courage in taking her characters to this particular place emotionally; while the conclusion is still very satisfying, she certainly did not take the easy route to complete this final novel. Sisterhood Everlasting rings very realistic and genuine, even as the twists and turns emerge as a bit, well, soap-opera-esque. I didn’t mind the crazy twists though, because let’s face it, what summer read would be complete without some major drama? Brashares struck an impressive balance between a light, summer read and a narrative with authentic emotions and a bit of depth. And of course, this novel is a must-read if you are an invested (or even casual) fan of the original series – since I wasn’t an original devotee, I’d be interested in others’ thoughts on how satisfactorily Brashares concluded the journeys of these characters. As a casual reader, I felt Brashares did positively fulfill reader expectations. 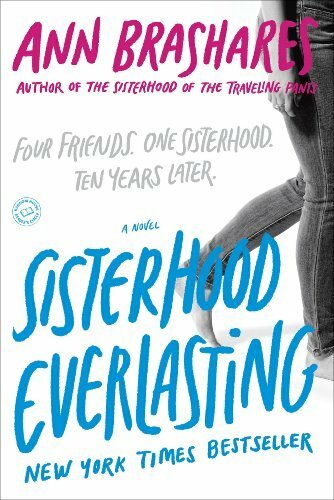 Ultimately, if you need a poolside read that features well-developed characters, offers engrossing plot turns, provides a fair amount of substance for a guilty-pleasure type read, and majorly keeps you reading, hang out in this Sisterhood one last time.